To Cite: A. Stokes W, W.Cerrati E, J.Lentsch E. Indications and Considerations in Minimally Invasive Video-Assisted Thyroidectomy, J Minim Invasive Surg Sci. 2014 ; 3(1):e12224. Background: The phrase “minimally invasive” is used loosely due to the wide range of surgical options and generally means a procedure not involving a large open incision. In 1998, Dr. Paolo Miccoli at the University of Pisa developed a technique of minimally invasive video-assisted thyroidectomy (MIVAT) for patients presenting with small thyroid nodules. The procedure involves a smaller incision, limited exposure, and endoscopic magnification to better visualize the smaller surgical field. From this point, thyroidectomy or hemi-thyroidectomy is performed using endoscopic instrumentation. Indications were initially limited to single, small non-malignant thyroid nodules, however the indications have gradually expanded since this surgery’s initial implementation. Objectives: We feel that this article provides an up-to-date research on the MIVAT procedure, while highlighting its rapidly expanding indications and excellent outcomes. Patients and Methods: The current patient selection criteria includes small thyroid nodules (<35 mm in diameter), a relatively normal thyroid gland (about <25 cubic cm), no evidence of severe thyroiditis, and no previous neck surgery or radiation. Results: The advantages of MIVAT compared with conventional thyroidectomy include improved cosmetic results, less postoperative pain and reduced hospital stay without any difference in safety, completeness or morbidity compared with the conventional approach. 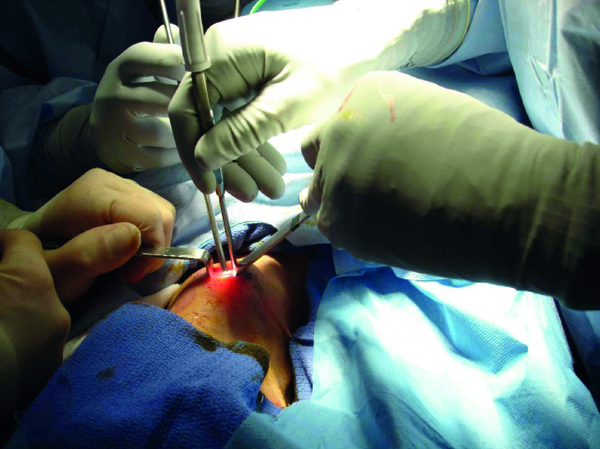 The primary drawback appears to be an increased operative time, which can be reduced as the surgeon becomes more comfortable with the procedure. Conclusions: As shown in the literature, MIVAT is a safe and effective alternative in the treatment of some thyroid diseases within the selection criteria. With the same level of complications, it offers a few significant advantages over the conventional thryoidectomy. Since 1996 when Gagner described the first endoscopic parathyroidectomy, many surgeons have expanded the boundaries of “minimally invasive” procedures of the neck (1, 2). The phrase “minimally invasive” is used loosely due to the wide range of surgical options and generally means a procedure not involving a large open incision. In 1998, Dr. Paolo Miccoli at the University of Pisa developed a technique of minimally invasive video-assisted thyroidectomy (MIVAT) for patients presenting with small thyroid nodules. He described the procedure as using the same central, single access that is used in parathyroidectomies. In the first two years, Miccoli and his colleagues performed successful MIVAT procedures in 65 out of 67 cases that met the selection criteria. The preoperative diagnoses included follicular lesions, toxic adenomas, small toxic multinodular goiters, and low risk (T1) papillary carcinomas (2). The procedure produced excellent results in patients including short hospital stays, small incision and minimal pain. 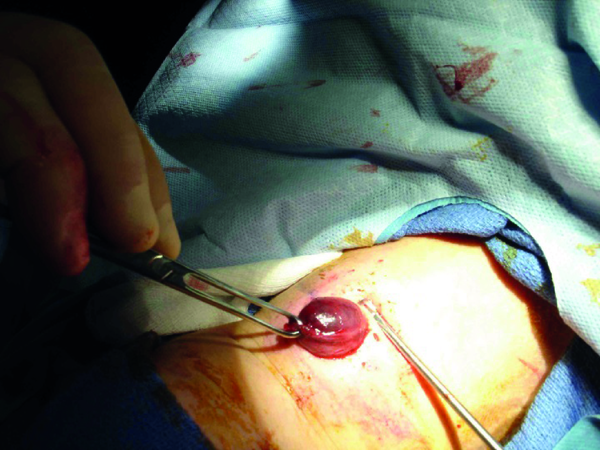 Complication rates were similar or decreased compared to the open procedure (2). The promising results of Miccoli’s procedures, both surgically and aesthetically, have encouraged others to explore MIVAT as a comparable option to conventional thyroidectomies. At the Medical University of South Carolina, the technique of MIVAT is based on that described by Miccoli and is now performed as an acceptable alternative to those who meet the expanded selection criteria. We feel that this article provides an up-to-date research on the MIVAT procedure, while highlighting its rapidly expanding indications and excellent outcomes. The procedure is performed on the patient in the supine position under general endotracheal anesthesia. A couple of centimeters above the sternal notch, a 15-20mm horizontal incision are made for the single access. To minimize bleeding, subcutaneous fat and platysma are carefully dissected and the cervical linea alba is divided longitudinally for at least three centimeters (2). Using only blunt dissection, the thyroid space is reached through the midline (Figure 1) (3). The strap muscles on the affected side are gently pulled aside with a small conventional retractor (army-navy type). A second retractor is then used to medially retract and lift the lobe (1, 4). The procedure is then continued endoscopically using a 30-degree endoscope 5 mm in diameter. The endoscope and the instruments are all inserted through the single skin incision (1, 4). Two conventional retractors are used to maintain the operative space (Figure 2). As in the conventional method, electrocautery should be avoided until the laryngeal nerves are exposed (1). Due to endoscopic magnification, the parathyroid glands can be easily visualized and dissected off of the thyroid (5). After the lobe is freed and the recurrent laryngeal nerve has been traced along its path, the gland is exteriorized and the operation is conducted as in open surgery under direct vision (Figure 3). The isthmus is then dissected from the trachea. 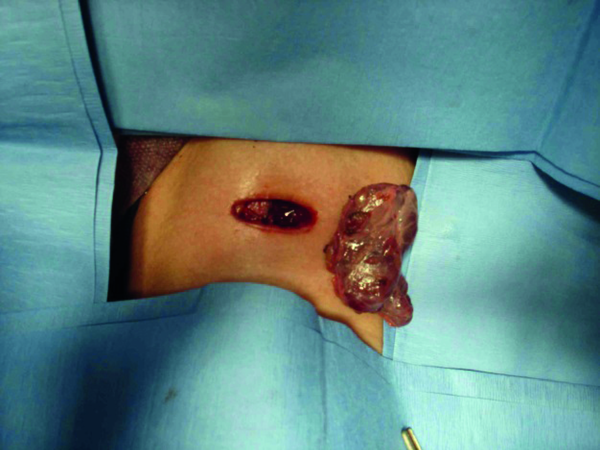 After removing the lobe, the procedure can be repeated on the other side for a total thyroidectomy and/or the incision can be closed by either subcuticular suture or skin sealant without the use of drainage (Figure 4) (1, 3). The patients most commonly chosen for MIVAT are those with a solitary thyroid nodule who have undergone fine-needle aspiration biopsy with inconclusive or insufficient results to rule out malignancy (5). Several factors are frequently considered like age, gender, ethnicity, family history, and number of nodules to predict a patient’s risk status for malignancy. For MIVAT, current patient selection criteria include small thyroid nodules (< 35 mm in diameter), a relatively normal thyroid gland (about < 25 cubic cm), no evidence of severe thyroiditis, and no previous neck surgery or radiation (5-7). MIVAT’s main and safest indication is still benign thyroid disease; however, a new indication includes “low-risk” malignancies such as well-differentiated papillary thyroid carcinomas (< 20mm in diameter) without presence or suspicion of metastatic lymph nodes (6-8). Recently stated in the literature, thyroid cancer is one of the most frequent indications for MIVAT (48.5% in one study) (7). With initial treatment of total thyroidectomy, it has a good prognosis in 95% of patients (4). The completeness of MIVAT is similar to that obtained with conventional thyroidectomy demonstrated by values of serum thyroglobulin, extent of node dissection, and radioiodine uptake in the neck (1 , 4- 7 , 9). Neidich MJ et al. recently looked to expand on MIVAT indications by assessing the safety of central neck dissection for thyroid carcinoma (10). In their small study of 28 patients, they found 11 patients with positive central lymph nodes (10). At 14 month follow-up there were no recurrences, and the procedure had no associated hypo-parathyroidism or permanent recurrent laryngeal nerve (RLN) injury (10). A previous contraindication for MIVAT was thyroiditis due to the assumption that adhesions would make dissection difficult and potentially increase rates of injury to the RLN and the parathyroid blood supply (6). However, two more recent studies of patients with incidental thyroiditis and Graves disease patients with thyroid volumes < 35ml have shown no increase in RLN injury, post-op hypocalcaemia, and overall morbidity for MIVAT verses conventional open surgery (4, 11). Therefore, preliminary data appear to indicate that adhesions do not play a significant role in causing MIVAT complications for patients with limited thyroiditis. In an early report on MIVAT by Miccoli in 2001, he reported the increased operative time to be 70 minutes for lobectomy and 110 minutes for total thyroidectomy (1). However, with any new procedure, a learning curve can be demonstrated. Miccoli described this curve in 2002 stating that in less than two years’ experience with the procedure, the operative time can be decreased by 44%. The mean duration of a lobectomy is now 40 minutes, which is comparable to the conventional method (2, 9). More recently, Pons Y et al. performed an analysis of MIVAT learning curve by the number of cases performed (12). They studied 50 cases of thyroidectomy or hemi-thyroidectomy performed by a surgeon unfamiliar with MIVAT and found an initial mean operative time of 98.5 minutes for the first 10 patients that decreased to 50 minutes after 30 cases had been performed (12). There was no change in operative time after performing the operation on the first 30 patients (12). Three of the first 10 cases require conversion to open procedure due to technical complications, but no further conversions required after this point (12). The advantages of MIVAT compared with conventional thyroidectomy include improved cosmetic results, less postoperative pain and reduced hospital stay without any difference in safety, completeness or morbidity compared with the conventional approach (2, 3, 5, 8, 9, 12). Miccoli and his colleagues in Italy confirmed this in an 833-patient prospective cohort published in 2006 (6). More recently, a retrospective review of 93 patients was completed at the Medical University of South Carolina demonstrating MIVAT operative times and length of hospital stay to be noticeably shorter than open thyroidectomy (13). With these advantages, there was no statistically significant increase in total, pathology, or anesthesia cost for hemi-thyroidectomy. The anesthesia costs for total thyroidectomy were actually significantly less for MIVAT compared to open surgery. These results are consistent with those found by Miccoli (1). Compared to the conventional thyroidectomy, MIVAT was found to have no difference in overall complications (2, 3, 6, 9), which is around 1% (8). These include laryngeal nerve injury, parathyroid deficiency, postoperative bleeding, infection, thyroid storm, and Horner’s syndrome. While most of the implications are very rare, they can present clinically as inspiratory stridor, dyspnea, dysphagia, and change in voice, numbness and tingling of extremities, ptosis, miosis, and disorientation (14). 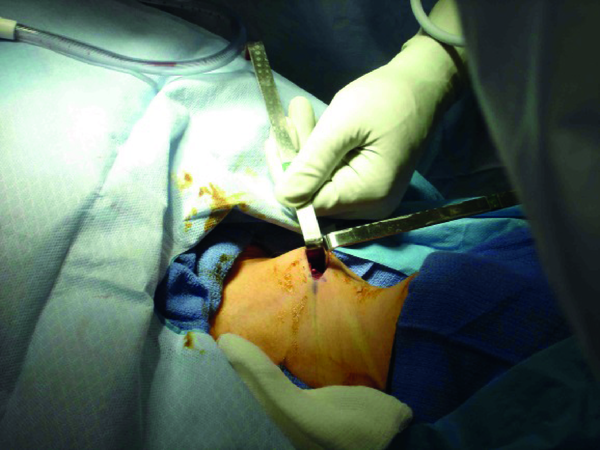 One study determined the risk of permanent complications to be lower in MIVAT due to the use of Ultracision, an ultrasonically activated scalpel, which significantly reduced the intraoperative blood loss and the length of operating time (9). As shown in the literature, MIVAT is a safe and effective alternative in the treatment of some thyroid diseases within the selection criteria. With the same level of complications, it offers a few significant advantages over the conventional thryoidectomy. While benign diseases remain the main and safest indication, this procedure has been expanded to include treatment of low-risk cancers and limited thyroiditis (8). With learning curve and initial equipment cost associated with this technically demanding procedure, it is most commonly performed at academic institutions. Given the strict selection criteria, MIVAT is only indicated for a minority of patients at the present time, however the criteria is expanding rapidly as confidence in the procedure grows. The promising results and increased patient satisfaction are driving the interest to expand the indications to offer this procedure to more patients. Implication for health policy/practice/research/medical education: We feel that this article provides an up-to-date research on the MIVAT procedure while highlighting its rapidly expanding indications and excellent outcomes. Financial Disclosure: The authors have no financial disclosures. Funding/Support: No funding was received to assist with the creation of this manuscript.